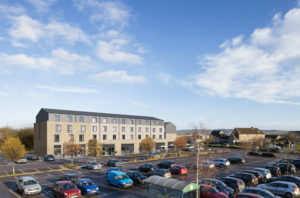 A PLANNING application has been submitted by Leekes of Melksham to build a Premier Inn hotel and a Beefeater restaurant in their car park. The 71-bed hotel will be owned by Premier Inn with a 246-cover Beefeater restaurant on the ground floor. Both the hotel and restaurant will be operated by Whitbread Group PLC. The proposals state, “Premier Inn, part of Whitbread Group PLC, is the largest provider of hotel bedrooms in the country with over 700 hotels across the UK and over 65,000 bedrooms. Whitbread employ over 40,000 people worldwide and are committed to sustainable, good design. The building will sit in the current car park losing 100 spaces from the 507 current parking spaces for Leekes. The company says it will make improvements to the current car park access. The hotel and restaurant will offer 20 full-time employment positions and 30 part-time positions. To see the plans visit the Wiltshire Council planning portal at https://planning. wiltshire.gov.uk and use the reference 19/00614/FUL. If you would like to make a comment on the plans, the consultation expires on Friday 22nd February with a target date for decision set for Friday 19th April. well it seems to me that leeks DO NOT GIVE A HOOT about the residents across from leeks or even Melksham FULL STOP. On top of it all with the premier inn AND the new lay out which every one as said will be HELL for all of us around Melksham and and its costing a mint at the waste of our tax payers money YES US. Just look at the hump over the bridge in town a few years ago put down taken up put down taken up it was not needed was it AND yes we paid for that mess also. SURPRISING HOW SOMEONE CAN SPEND OTHER PEOPLES MONEY WITH OUT ANY CONCERN. MY LAST WORDS ARE WELL YES IT LOOKS LIKE WE WILL NOT GET A BYPASS EVER. WITH ALL THE MONEY THEY ARE USING FOR THE ROUND ABOUT AND LEEKS WELL IT SPEAKS FOR ITS SELF DOESN’T IT. It looks like leeks might will be the only winner on this one, so we will all suffer because NO ONE gives a hoot. what is it they say about there self’s leeks your family store, my foot, more like the heart full dodger money from all.